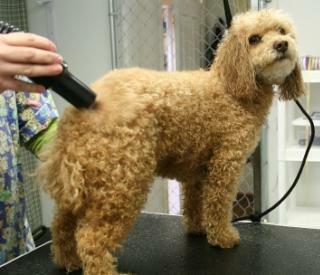 Grooming poodles is a necessity for those who own the dog. They don't shed, so they need to be groomed and clipped throughout the year. Because they are non shedding, a poodle may be suitable for those with allergies. Your pet's coat has a thick, curly, wiry outer coat, and a wooly soft undercoat for warmth. Puppy coats are wavy, not curly, and soft and fine. Once he becomes an adult, his coat gets curly. Toy poodles are smaller than miniatures and standards, so their grooming needs won't be as costly. You'll want to have poodle grooming done every 6 to 8 weeks. How do you find a good groomer and one you are comfortable with? Ask your vet, breeder and friends who have poodles. Look in the phonebook, then look them up online to read reviews. Schedule an appointment with the groomer to see how professional she is, if she's certified, if she loves animals and can communicate with them and you, if her shop is clean, and her prices reasonable. Better yet, take your pet along for the visit, that will tell you a lot! Let your groomer and dog become friends. It's important your pet like, trust and respect the groomer. If you're not sure what kind of trim your pet needs, speak with your groomer. 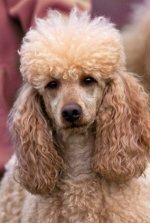 She'll be able to suggest poodle clips that fit your poodle's personality and lifestyle, and maybe give you some poodle grooming tips to use at home. What does a day at the poodle spa include? Usually a bath, blow or fluff dry, hair cut and nail clip. In between clippings, poodle owners need to do some maintenance at home. Bathe her at least monthly if once a week is too much (unless she goes to get clipped once a month) and brush her daily. 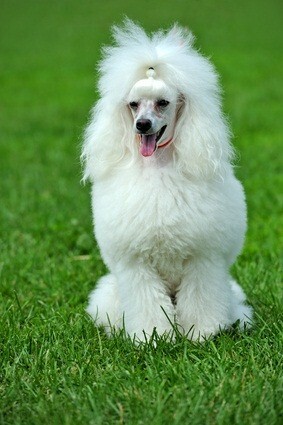 Poodles love the attention when they are brushed; it's a pleasurable experience for them and helps them bond with you. You'll also want to check her eyes, ears and teeth once a month to make sure they're healthy and to catch any problems quickly. If you'd like to learn how to groom a poodle, ask your groomer. But grooming poodles is probably best left to a professional groomer. Your pet has to be groomed, so allow for that in your budget. Find a groomer both you and your dog are comfortable with as your poodle will be going at least six months a year to get groomed.